If you’re an affiliate marketer living outside of the USA, it can be a challenge to get paid with Amazon and other popular affiliate programs. Most companies offer check payments, but they can take a long time to come. Aside from that, banks also charge up to $50 per check to cash it, along with a very bad exchange rate. In this article, I’ll be introducing you to a solution called Payoneer which I’ve been using for the last 4 years to fully receive my affiliate commissions. Payoneer is no doubt the best solution to getting paid from US or EU based companies, as if you have your own US or EU based bank account. The way it works is simple. Payoneer provides you with personal collection account numbers, which allow you to receive payments via ACH transfers from US companies and via SEPA transfers from EU companies, wherever you are in the world. Your first step is to sign up for a free account at the Payoneer official website. Using the link above, you’ll earn a $25 reward once your card is loaded with the first $100. I’ll get $25 for referring you as well (at no extra cost to you). After visiting the link and clicking on “Sign Up & Earn $25”, you’ll see the sign up page. Remember to use the right home address as they’ll be sending you a letter via mail with a code which you will need to activate your Payoneer account. Simply login to your account, then under Receive choose either US or EU Payment Service. I’ve been a happy Payoneer user for the last 4 years and they really helped me grow my business better. If you’re looking for an easy, reliable way to get paid as an affiliate marketer, then this is the solution that gets my best recommendation. Thank you for that! I just started and was wondering how to get around this “payment via check” thing. I still don’t understand why the companies don’t offer payment via transfer. I was wondering how you get paid in SEA. I’m from Malaysia btw. Have you faced any issues in the 4 years using payoneer? How much are the fees when withdrawing money out of payoneer? No I haven’t had any issue. They charge 1% fee when you receive the money. And $20 withdraw fee. With respect to Amazon, how do you deal with the tax holding issue? I am UK based and pay taxes in the UK, but again require that I stipulate that I am a non US resident in order not to withhold taxes @ 20%. At the same time they stipulate that they will only pay to non US citizens via cheque. Any clarity would be appreciated. That’s why we use Payoneer to receive payments via ACH direct deposit. I filled the tax form and paying 0% as I’m outside of the US. Hey Tung, have you ever faced any withdrawal limits with payoneer. I live in Pakistan, and I’ve been using a bank named MCB that doesn’t lets me withdraw more than $200 at once. 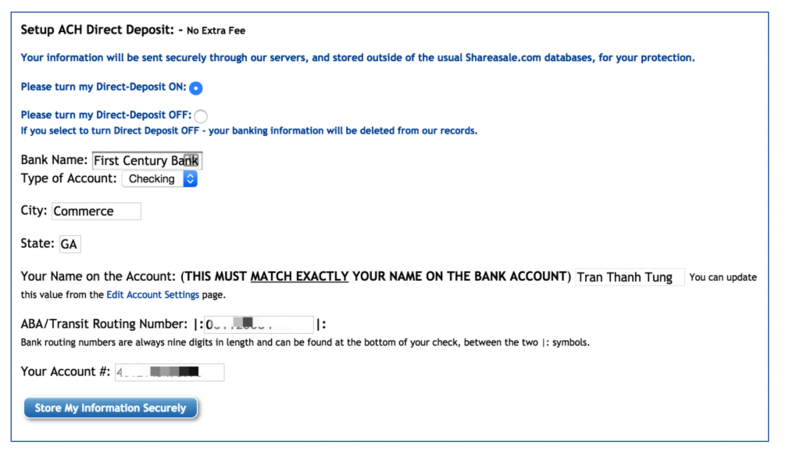 Do you think the restrictions are from the bank or payoneer? Have you ever faced any restrictions with withdrawals in your country? I think the limit for most accounts is $10,000 per day. So I think in your case the problem is on your bank. i just withdraw my december earnings using payoneer its really fast… just 2 days from amazon the money can be withdrawn from payoneer.. i went to citibank and its really very easy.. its a checking account…glad i switched to this.. the cheque was really slow it took about 4 month to be encashed…. with payoneer its only 2 months and 2 days..
Usually I enjoy for reading your new post Tung, but No for this post. Could you give me some further explanation? Is this something you already know? Nice, but how taxation works? You do not have to pay taxes in US, right? I’m not the right person to ask about taxes. But currently I’m not physically in the US so I’m paying 0%. A little off topic question for non US residents. I am currently out of US and do use payoneer to get my funds. I earn income via amazon affiliate. As of 2016, i am constantly making about $1000 from Amazon but i am concerned about how would i deal taxes. Currently my amazon affiliate account shows 0% taxes. What do you do about the taxes. Would really appreciate your help. I’m not the right person to ask about taxes but I think if you’re physically outside of the US, you will only need to pay taxes in your country. US associate have a tax withheld from their earnings. So Amazon acts like IRS agent in this case. In regard to non-us publishers, it seems to me that they just require a form as a confirmation that your income is not taxable in USA. Which doesn’t mean that you shouldn’t pay taxes at all. You should, but you pay tax of your country. Your tax is your problem here. I would consider a meeting with a local tax counsel if I were you. Thanks for the great answer Andrew! Great post! I’m currently in the US, but I’m coming back to Vietnam in about 3 months and haven’t quite figured out a workaround for the payment issue yet. This is exactly what I needed. Btw, Do you mind if I ask you about whether you have to pay any kind of tax for your affiliate commission (either to US or Vietnamese government)? If yes, what are the procedures? It would be awesome if you write an article about tax for Vietnamese affiliate marketers. Thanks again for the valuable information, keep it up! I don’t pay any tax here 😛 The rules are not clear so I don’t know how to do it even if I want to. Great review really enjoyed it. One thing though, I’m from Trinidad and Payoneer doesn’t support my local currency, how can i use payoneer to withdraw money otherwise ? You can withdraw in USD to your local bank. Good recommendation for those who live outside the US but want to participate in US-based affiliate marketing programs. People who live in countries with good conversion rates are lucky because they get the best of both worlds. I’m a newbie with affiliate marketing, so I’ll be following your blog closely. Thanks! Thank you sharing best info, I also used to payoneer more than 1 year ago for my business. Sorry I can’t provide help with this. PLease contact Amazon associate reps for more information..
You can go for EIN(Employer Identification Number) which is free. You can call here (+1 267 941 1099) to get EIN for FREE but you need to stay on the line for long like 30-40 minutes. Can we use Payoneer to deposit money into our non-US bank accounts without going for the MasterCard option? I prefer to have the money deposited into my bank account as that is more convenient. I’m not sure. You should ask them. I’m surprised that you recommend proceeding so, as Direct Deposit payment is only allowed if you AND your bank are based within the United States. Also, this is conflicting information to Amazon regarding your situation: for taxation you claim that you’re outside the US, but for payment you claim that you’re within the US. Is that common to proceed so among online marketers? Aren’t you afraid of having your Amazon associates account suspended because of this? I’ve been doing this for years without any problem. Never heard about accounts got banned due to this. I am from India and i tried to use payoneer as payment method. This month amazon tried to make payment via payoneer but payment got failed. I contacted Amazon and they said ,they do not support payoneer. How you are receiving payment via payoneer? I just entered my information in like the screenshot in the guide. You are right. Payoneer rocks. I have been using it in Kenya for the past 2 years. I pay $3.50 to withdraw my earnings. Cheap and efficient. This is what I received from Payoneer – Payoneer doesn’t support receiving payments via Amazon affiliates. At the moment only sellers accounts are supported. Any news about this statement? Comment posted 3 months ago. Are you other guys receiving money from Amazon Affiliates correctly? I am in process of selecting payment solution – working with Amazon US Affiliates and live in EU. Followed your blog on and off, thanks for the inspiration and hard work. Just letting you know I’m using your affiliate link to sign up to payoneer. Hi, Tung Tran. I’ve got a mastercard and visa and I live in Kyrgyzstan. Can I be affiliate to Amazon affiliate programm and other US and UE based countries. Thanks. Will wait for your answer.)))))) Max. I’m not sure sorry. It’s best to contact Amazon for these questions. That was such an informative piece. I live in Kenya and just completed my Amazon associate account registration including my non-US TAX information. I have been using Payoneer since 2013 and I must agree that it’s a lifesaver especially for freelancers in countries where you can not withdraw your PayPal funds directly your local bank account. I was not sure if I should include my US payment service details (Payoneer details) in the “direct deposit” option until I came across your post via Cloudliving in Facebook. So my question was how long does it take for one’s Amazon earning to reflect in his or her Payoneer account. Secondly, using the “direct deposit” option can I initiate withdrawal immediately my earning are over the $10 minimum earnings? Amazon automatically pays you if you hit the minimum you set. I wonder why do you recommend choosing the “Prepaid MacterCard Card” option if you actually want to be able to withdraw the money to your local bank account? Shouldn’t we choose the option “Local Bank Account”? Thanks for the great article. But the payoneer link in this blog is not working. Yeah payoneer is good for fast transfer. But why amazon takes two months to make money available to withdraw after the sales. Just wanted to let you know i signed up using your link! Also, did you receive the first mail in vietnam? Just to let you know that I have just ordered my card through your affiliate link. Thanks for the article. It is over a year since you wrote it and the process is still exactly the same. How did you personaly workaround this, what’s the best pratices for non-US affiliates? they don’t support Payoneer and for them it’s frowned upon to use that as a payment option for non USA affiliates..
Maybe they don’t officially support it but they look the other way if you use it , but in any case i dont feel comfortable using it if my account will be in jeopardy..
I’ve been using them for years without any problem. 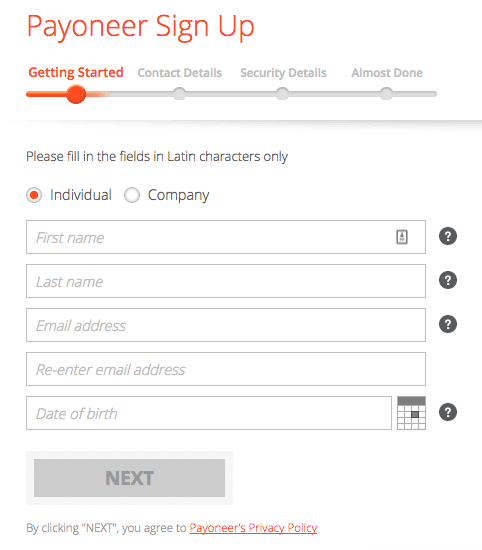 So when u sign up for payoneer do you put a u.s. address? 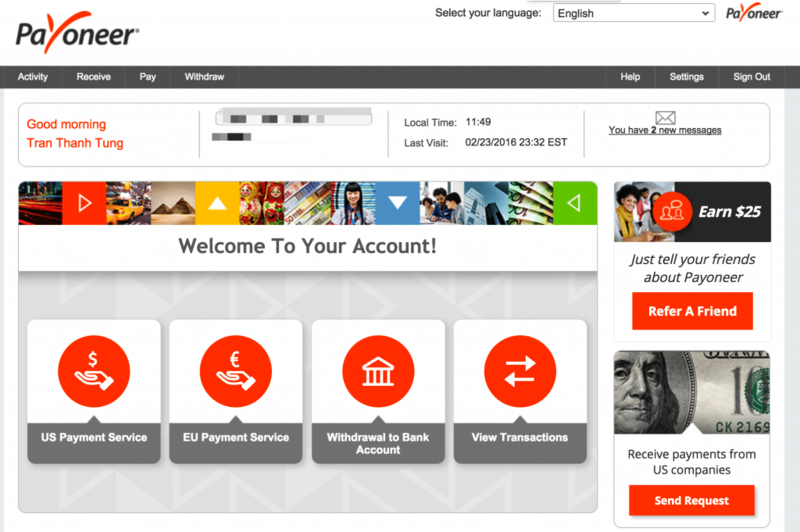 Man, I am Non-US resident and I wonder that is there anything similar to Payoneer? Because banks here take big commission from Payoneer and well I don’t want to get a cheque either. By the way, I can’t use paypal too 🙂 Can you suggest me a solution? Thanks for this post. 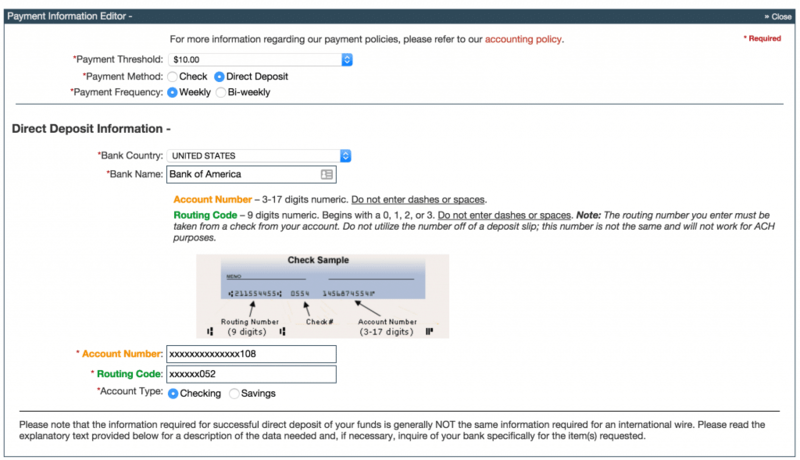 I’ve signed up a US bank account and input that into my Associate’s Payment page, but the payment didn’t come through. When I asked a consultant, they said it’s because my mailing address is not in the US, so based on that, I fall under the ‘international’ category and so the direct deposit payment won’t come through. They also said the same applies for tax information, I’d need to have a US Social Security Number or the payment wouldn’t go through. How do you get around this in your Amazon Associates account? Do you have your mailing address set to a US-based address? I registered my account a long time ago so I don’t know much about this honestly. Sorry I can’t provide much help on this topic. Hi Tung. I am from Malawi, Africa, one of the poorest countries in the world. I am wondering, is it possible for me to do affiliate marketing with companies like Amazon and succeed? Your country is not poor,but the attitude of your citizens are. Hi… Thanks for the Article… I have a Question.. I am from Pakistan. If I make Payoneer Account with prepaid master card.. and Then Want to receive payments from Amazon.. Then Which bank i have to enter..?? US Based or Pakistan’s based…? ?